Following a wish on our feedback site (http://feedback.wikidot.com/wish:764 - chessdiagrams) I made a quick search on the chessworld for an easy implement of such an chess image builder.. 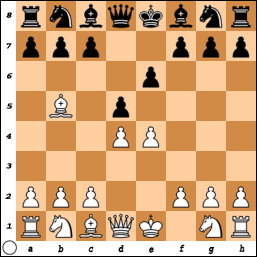 The normal way is to search for some free apllications to create at the home pc some png or jpg images of a chess diagramm (or a html table) and upload it to a wikidot page to insert it as an image of a goven position. Using the image-source url as a command! Put after an image tag the "url adress" of the ChessImager.php and after the fen= end your "wished position in the FEN notation". 5N1k/6p1/7p/4P3/pp2Q3/4q3/1P4PP/2b4K/ reads as for the 1. line (line 8) 5 effective empty fields, White Knight, 1 empty field, black King. next line 6 empty fields, own black pawn, 1 empty field.. and so on). For a first try not so bad ! the last move(s), the situation of rochades, or if one King was in chess ( before a rochade) a,.s.o. Now it should be easy to use chess diagrams on Wikidot pages. On Steve's chess site there are some wonderfull links into the world of chess too! After some searches in the world of chess i wrote a little "howto" to explain how to insert position images on wikidot pages. For a "Blog" it is of small interest ( I beleive) and therefore I want to push it more in our forum and twitter for our visitors. Have a look on the main page of this post. I used http://www.eddins.net/steve/chess/ChessImager/ChessImager.php some years ago but it seems like it is gone now! So I wrote my own chess imager that now lives at appforce.se/chessboard. But when I try to use this url in image tags it does not work. Why? I.e. I cant use url in an image tag! But I can hit the url above. As Helmut_pdorf said, I think it is the spaces in the URL Gunnar. I would suggest you replace them with %20 as you have in your example link above. That should work OK.
is clickable , but your last ( hit) isa not - the spaces shows a null point message error. PS: THANKS FOR THE NEW APP! It would be great to wrote some helping guide here in wikidot! - Or elsewhere! There are a lot of such diagrams in the net ! Thanmks again for bringing this to our knowledge!